Now, it's not much that gets me over to the Far East but I was pleased to make an exception to go over and check out a trunk show of beautiful hand-painted and hand-spun yarns made by my friend Tigerlilith . 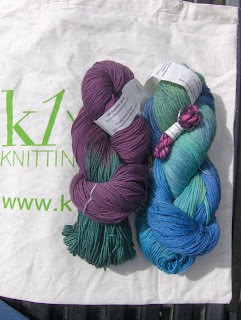 She has a web presence as well as the fact that some qualities and colourways are available from K1 yarns . I selected some 2-ply laceweight, seen here in blue, or Aegean to be precise. It feels divine, being made from baby alpaca, silk and cashmere. DH was pawing it for ages when I showed him. Next to that is some superwash merino 4-ply sock-yarn in Violets, which is a perfect name to encompass all the shades of purple in this one. Sitting on top is my little "Emergency yarn" loyalty key-ring gift, he he. Next up we have some more of the Merino Superwash 4-ply, this time in the special K1 colourway- predominantly damson with bottle green in places. I've always liked this one when I've seen it online so I took the plunge when I saw how lovely it was in the flesh as it were. 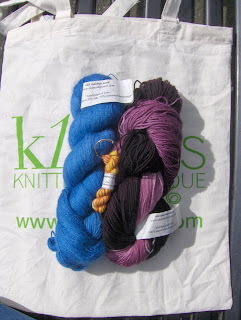 The last Old Maiden Aunt offering is a bamboo-merino blend in Neptune. I am always magnetically pulled towards this type of colour combo and the hand of the yarn is just yummy. 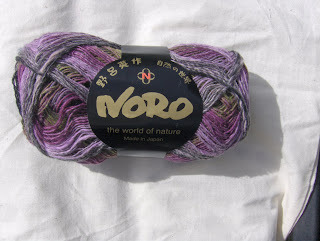 I hadn't been to the Edinburgh branch of K1 Yarns before, so while I was there I took the chance to pick up some of the Noro Kureyon sock yarn I'd been hearing about too. These are trully beautifull yarns. I love the those on the first picture. Love these colors.